I was determined this year not to work myself half to death during the first week of June. And what do you know? Marvelous things havw dropped into mt inbox. Like this one, gleaned from IHRO, originally published in The Post. June 5 and June 6 are reminders of the 'Operation Blue Star' when Indian military, led by General Kuldip Singh Brar, launched attack on the Golden Temple, the holiest shrine of Sikhs in 1984, to arrest Jarnail Singh Bhindranwale, the only leader who had been boldly fighting for the rights of Sikhs. The Indian Army supported by troops and armoured vehicles broke all records of the state terrorism and extra-judicial killings through that barbaric operation. It is notable that at that time, there were only 251 Sikhs inside the complex to protect the Golden Temple, resisting well-trained Indian army, equipped with sophisticated weaponry. In those days, majority of the Sikhs were coming to Golden Temple to celebrate Martyr Day of Guru Arjan Dev Ji. Then the Indian regime used tanks and destroyed the Akaal Takhat Sahib, which is right in front of the Golden Temple. On June 6, when all Sikh fighters were martyred along with Jarnail Singh Bhindranwale, Indian troops entered the temple with their shoes by even deliberately ignoring the holiness of the place, showing utter indecency. When the Indian Army felt that only 251 men had prevented them from entering the temple for so many days, they started killing innocent Sikhs who had come there to visit the Temple. The only purpose was to hide their humiliation. In connection with that incident of state terrorism, Ramnarain Kumar and George Sieberer in their book, The Sikh struggle, write: "The army killed every Sikh who could be found inside the temple complex. They were hauled out of rooms, brought to corridors on the circumference of the temple and with their hands tied behind their back, were shot in cold blood. Among the victims were many old men, women and children." However, all visitors were locked up in rooms for two days without any food, water, or electricity and were starved to death. Besides, the Golden Temple remained under the army control for many months. The brutality of the 'Operation Blue Star' was not confined to the Golden Temple. Indian armed forces simultaneously attacked 40 other historical gurdwaras all over East Punjab. When Sikhs in other states came to know about the desecration of the Golden Temple and massacre of their brethren, they quickly left for Punjab. New Delhi turned its attention to Sikh military and tried to stop them before they could reach Punjab. Many Sikhs were assassinated on the way and many others were arrested. According to an estimate, about 50,000 Sikhs were killed within a few days. The whole Amritsar city was sealed and was burnt. A number of tourists either were murdered or arrested. Shops belonging to Sikhs were looted and their houses were set ablaze by Hindu mobs. In most of the cases, Sikh women were molested and some persons of their community were also burnt alive. Another tragic dimension of the military operation is that historical Sikh artifacts — all the literature written by the gurus was taken away by the army and was also set ablaze. In this regard, New Delhi claimed that it was burnt while bombing the Temple. In November of the same year, two dedicated Sikhs named Beant Singh and Satwant Singh who were posted at Premier Indira Gandhi's residence in New Delhi, assassinated her. Then Hindu riots erupted in the capital and other cities in which more then 15,000 Sikhs were killed in broad daylight by the supporters of Indira Gandhi while police watched silently so as to provide the Hindus with free hand to massacre Sikhs. 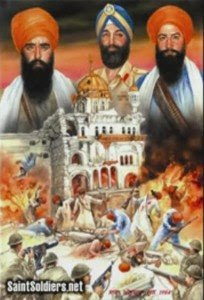 The attack on the Golden Temple and genocide of Sikhs only accelerated the liberation movement for Khalistan as Bhindrenwale became a folk hero. Meanwhile, after 'Operation Blue Star' and the Sikh genocide, Sikhs' struggle for independence continued, but the Indian government made every effort to crush the same with the state machinery. To maintain their control over the Golden Temple, another attack was launched on the Temple in 1987, called 'Operation Black Thunder'. This time only Sikh resistance was the main target. In that respect, quite a number of people of their community were killed and dead bodies lay inside the sacred place for many days. According to a report, many trucks were loaded with dead bodies and all were burned with kerosene oil. Afterwards, 'Operation Woodrose' and 'Operation Black Thunder-II' were conducted against the Sikh community, which also assassinated them extra-judicially. After these barbaric operations, Sikhs organised themselves into an armed power in order to fight the Indian state terrorism. Many Sikhs left India to escape religious persecution. Sikhs have spread out all over the world to keep the movement of Khalistan alive. In this connection, their struggle is still going on. A renowned scholar, Dr. Sangat Singh remarks in his book, The Sikhs in history, "The Indian government has killed over 1 million to 1.2 million Sikhs. During last 18 years Indian government has also killed 50,000 Christians and 100,000 Muslims since 1947. The only way to stop this state terrorism is to create a Khalistan state, where Sikhs and other religious people can enjoy their freedom". It is of particular attention that the Indian government dominated by politicians from the Hindi heartland uses force ruthlessly against any move to free Assam, Kashmir, Khalistan, Mizoram, Nagaland, Tamil Nadu and Tripura. Consequently, 'Operation Blue Star' was one of the most inflammatory actions ever taken by the Indian government. Still, coupled with intermittent massacre of Muslims, Christians, including that of the lower caste communities tends to expose the real face of New Delhi. Ground realities display that India is a fundamentalist state under the mask of secularism. And the tragedy of 'Operation Blue Star' and its drastic aftermath has, without any doubt, endorsed this fact. That was a gud thing that happened in 1984 in amritsar becoz most of the people were terrorist. and don't forget the major who led the army was also sikh. don't worry it is a lost cause to create khalistan same as create kashmir or independent gujrat or tamilland or marathaland.. But even if Sant Jarnail Singh Bhindranwale had been a terrorist - which he wasn't - what about the women and children who were slaughtered along with the Khalistanis? Were they terrorists? Did they deserve a torturous death just for being Sikhs visiting Harmandir Sahib? What about the nonSikhs visiting? You are wrong about other things, too. One day the politicolegal fiction called India will fall into many pieces, even if we Sikh sovereignists do nothing. We will be there to save Khalistan/Punjab from the horrors of anarchy. You are wrong on at least two other issues, too. These blogs - at least this one - are records of our history. Additionally, they are a great deal of help in other ways; they not only spread news of various issues and events; they also are morale boosters, spreading throughout the sangat the chardi kala we Sikhs are famous for. Finally, our efforts to establish Khalistan are peaceful now. There is no lack of courage. It is just that our battle now is being fought through peaceful, legal channels, such as the United Nations. Additionally, one of us does, in fact, live in Amritsar. As for me, I am too ill to travel. My dead body would be of no aid to Khalistan at this time. Are you a Kashmiri Freedom Fighter?